SoftTALK DOS is, as the name indicates, DOS-based software that will connect any PC from the modern Pentium Pro and Pentium II-based systems to the small Hewlett Packard 200LX palmtop computer (and even the ancient XT-based systems) to a Nikon F90X/N90S camera over a specialised communication cable such as the popular HarTALK. Why a DOS version if a 32-bit GUI version exists? Some photographers today have PC systems that are too outdated to run the modern operating systems. Since the newer 32-bit GUI version (SoftTALK 2000) demands modern operating systems and speed, it will not run on such outdated systems. With the DOS version, these older PC systems can remain useful in the studio by handling the camera communications. Early attempts by the It industry to shrink the size of DOS based systems to palmtop size, resulted in small computers that run DOS. SoftTALK DOS provide these users with the ability to communicate and control their camera systems, with the systems at hand. Another reason for its existence is pure sentiment. SoftTALK DOS was the origin of the modern SoftTALK 98 and the new SoftTALK 2000. What makes SoftTALK DOS special? It runs on portable (sub-laptop size) systems, capable of running DOS. SoftTALK DOS provides advanced connectivity features - without forcing you to purchase a computer with processing power that, seemingly, rivals that of a Supercomputer. 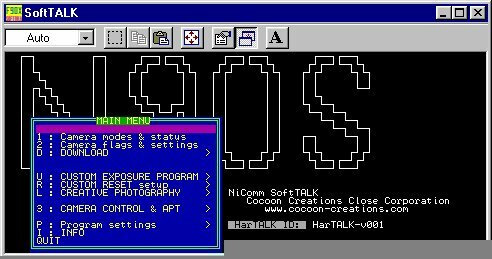 These screen captures of SoftTALK DOS clearly illustrates that, although you do not need a supercomputer to run SoftTALK DOS, the user interface is clean, friendly, powerful and efficient. 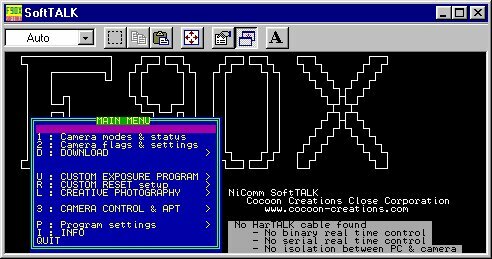 This is a frame grab from a live SoftTALK DOS session connecting a PC to a F90X, showing the user interface. At startup, the program will look for any hardware interface cable. SoftTALK works with other cables as well as with HarTALK, however, because the HarTALK interface is far superior in design to others, there are some functionality that will not be available when using other cables. The grey box at the bottom of the screen provides a report-back on the start-up analysis of the cabling system. In this case, SoftTALK DOS was connected to a camera with a standard Nikon Interface and, therefore, some functions will be unavailable. If no interface and camera was found to "Talk" to, SoftTALK will allow you to work in an off-line mode. This is a frame grab from a live SoftTALK session connecting a PC to an N90S. In this case, SoftTALK has found the on-board processor inside HarTALK and the camera's on-board processor to "Talk" to. The gray box at the bottom of the screen reports that HarTALK firmware version 1 was found. This is the ideal situation for SoftTALK: Now SoftTALK will pull out all all the stops to provide the full set of connectivity features that makes this range of products great! The following features are available in SoftTALK DOS. This is the full feature set of SoftTALK DOS and is available when communicating to a Nikon F90X or N90X. When connecting to other models (such as the F90, N90 and F5) this feature set is limited for SoftTALK DOS only. Newer versions of SoftTALK, such as SoftTALK 2000, do not have such limitations. SoftTALK DOS was designed to provide full connectivity for the F90X and N90S models. SoftTALK DOS provides remote controlled focussing and firing for F90X, N90s, F90, N90, F100 and F5. Full support for the F90 & N90 were added later in the development of SoftTALK 98. Full support for the F5 is currently added in SoftTALK 2000. Support for the F100 will be added to SoftTALK 2000 or later. Also note that all development of SoftTALK DOS has been stopped in 1998 in favour of SoftTALK 98 and 2000. SoftTALK DOS is therefore to a large extent built around the F90X and N90S, whereas the newer 32-bit versions will support more models. The following comparative matrix provides an indication of which features will currently work with a specific camera model. This matrix will change as new versions of SoftTALK becomes available, we therefore recommend that you place a bookmark here and watch this matrix grow in future. Nikon (and presumably F90, N90, F90X, N90S, F100 and F5) are registered trademarks of Nikon Inc. and Nikon Corporation Japan. Windows, Windows 95, Windows 98 & Windows NT are registered trademarks of Microsoft Corporation. Pentium, Pentium Pro and Pentium II are registered trademarks of Intel Corporation.